Home / Movie Database / That Thing You Do! Tom Hanks writes, directs and co-stars in this refreshing, big-hearted comedy that captures the overnight triumph of an American rock band during the glory days of rock and roll. When a young appliance salesman agrees to fill-in for an injured drummer in a local talent show, four shooting stars are born. 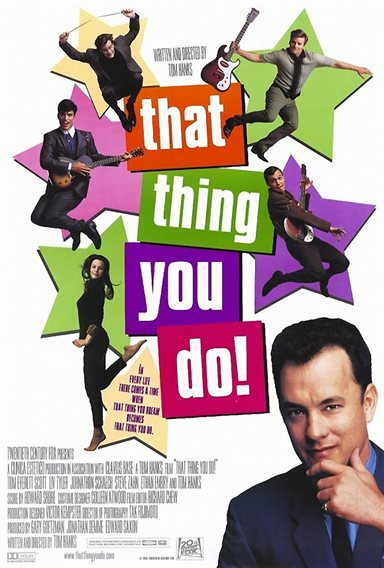 Faster than you can say "That Thing You Do," a Play-Tone Records executive (Hanks) signs the group and catapults them to fame as their signature tune skyrockets to the top of the charts! Download That Thing You Do! in Digital HD from the iTunes store. That Thing You Do! images are © 20th Century Fox. All Rights Reserved.